『월인석보』는『월인천강지곡』과『석보상절』을 합하여 세조 5년(1459)에 편찬한 불교대장경이다. 석보는 석가모니불의 년보 즉 그의 일대기라는 뜻이다. 조선 세종 28년(1446) 태헌왕후 심씨가 죽자 세종은 그의 명복을 빌기 위해 아들인 수양대군(후의 세조)에게 명하여 불교서적을 참고하여 한글로 번역하여 편찬한 것이 곧『석보상절』이다. 세종 29년(1447) 세종은『석보상절』을 읽고 각각 2구절에 따라 찬가를 지었는데 이것이 곧『월인천강지곡』이다.『월인석보』는 완질이 현재 전하지 않으므로 전권의 수량은 확인할 수 없다. 월인석보 권9,10(月印釋譜 卷九,十)은 세조 당시에 최초로 간행된 것으로, 2권 2책으로 되어 있다. 책의 크기는 가로 22.5㎝, 세로 30㎝정도이다. 권 9는 첫 장에서 제3장까지 없어졌고 제35, 36장은 상 ·중 ·하 3장씩 분류되어 있다. 이밖에 부분적으로 훼손된 것은 베껴서 써놓았다. 권 10은 첫 장에서 제122장까지 되어 있으나 문장이 완전히 끝나지 않아 몇 장이 떨어져나갔을 것으로 보인다. 권9의 내용은『월인천강지곡』제251장에서 제260장까지이고, 권 10은『월인천강지곡』제261장에서 제271장까지의 내용이 수록되어 있다. 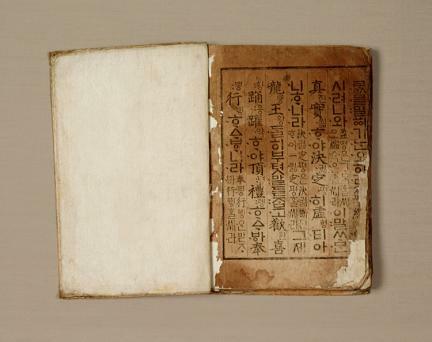 Worin seokbo (Episodes from the Life of Sakyamuni Buddha) is a great collection of two Buddhist Sutras, namely, Worin cheongangjigok (Songs of the Moon's Reflection on a Thousand Rivers) and Seokbo sangjeol (Episodes from the Life of Sakyamuni Buddha), which was published in 1459 (the fifth year of the reign of King Sejo of the Joseon Dynasty). Seokbo means ‘Buddha’s chronology or biography.’ Seokbo sangjeol (Episodes from the Life of Sakyamuni Buddha) was translated into Korean from the Buddhist works by Grand Prince Suyang (later to become King Sejo) and published in 1446 (the 28th year of the reign of King Sejong of the Joseon Dynasty) in order to pray for the repose of Queen Soheon’s soul. In 1447, King Sejong read Seokbo sangjeol and composed a paean to its every two lines, which are collectively named Worin cheongangjigok (Songs of the Moon's Reflection on a Thousand Rivers). 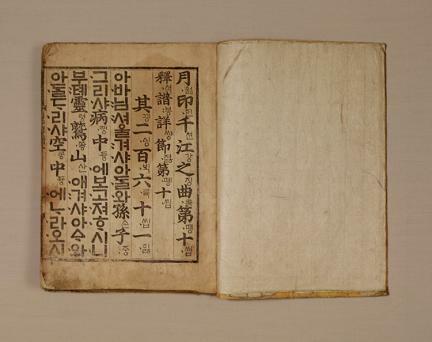 As Worin seokbo has not been handed down to the present in a complete set, the original number of the volumes is unknown. 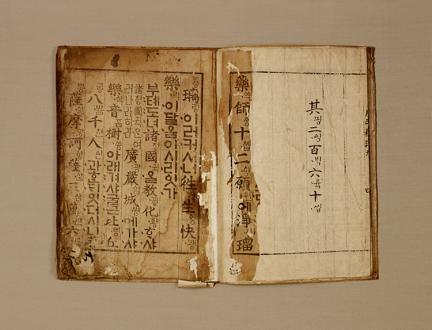 Volumes 9 and 10 of Worin seokbo were bound into two books and published in 1459 (the 5th year of the reign of King Sejo) in the original print. The book is 22.5 cm wide by 30 cm long. Volume 9 of Worin seokbo is missing chapters 1 to 3, while chapters 35 and 36 were divided into three pages each (first, second, and third). Also, some parts of the book appear to have been damaged and must have been supplemented at a later date. Volume 10, consisting of chapters 1 to 122, has an incomplete end sentence, which suggests that some pages are missing. 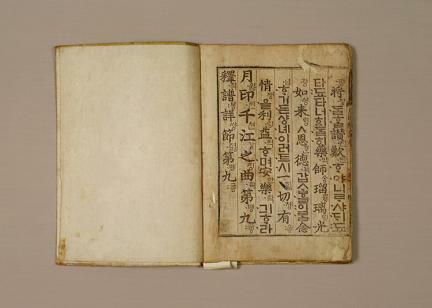 Furthermore, volume 9 contains chapters 251 to 260 of Worin cheongangjigok, while volume 10 contains chapters 261 to 271.